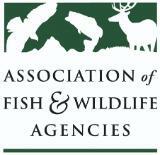 The Association of Fish and Wildlife Agencies' mission is to serve as the "voice for fish and wildlife" by helping to foster a deep appreciation and understanding for the public management and conservation of the natural communities that represent the diversity of North America--fish, wildlife, and their habitats. Leadership in taking all such legal and other proper actions to further the cause of maintaining an adequate supply of fish and wildlife and other natural resources in North America. Taken together, the State Wildlife Action Plans offer a unique and comprehensive framework for viewing the wildlife, habitat, and conservation needs at a national scale. Each of the plans focus on practical, proactive measures to conserve and restore important lands and waters, curb establishment of invasive species, and address other pressing conservation needs.